The ever-evolving medical transcription industry has undergone a variety of changes over the years. Factors such as regulations, advancements in technology, and workflow modifications all contribute to the way the industry has flourished. At Fast Chart, we make it a priority to stay updated on the latest trends in medical transcription so that we can provide our clients with the highest quality medical transcription services possible. Read on to learn about how medical transcription has changed within the past decade. Security has become a significant aspect of medical transcription. Due to the internet and mobile connected society we live in today, security issues regarding patient records and information have been given far more attention. 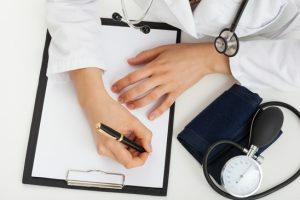 A medical transcriptionist has to be more cautious when working with sensitive patient information and ensure that he or she is HIPAA compliant. As voice recognition systems have developed, the responsibilities of a medical transcriptionist have shifted. In the past, a doctor would have to dictate medical reports to a transcriptionist. Recently, however, doctors have been dictating directly to an intelligent computer software instead. This has forced transcriptionists to focus on editing and catching errors that may occur when technology translates medical terminology. Accuracy and attention to detail are now of utmost importance. In previous years, medical narratives were transcribed in a word processed document. In order to meet the recent electronic health records (EHR) guidelines, transcriptionists must now follow a structure data format. The structured data format consists of structure templates, point and click fields, and pull down menus. These new guidelines are intended to create a standardized method of maintaining digital records. Instead of hiring and managing a team of in-house medical transcriptionists, more and more medical practices are outsourcing medical transcription services. Outsourcing is an effective way for medical organizations to reduce costs, follow regulations, ensure accuracy, and shorten their accounts receivable cycle. Although technology will continue to support the medical transcription industry, there will always be a need for well-trained medical transcriptionists. Medical transcription will continue to be a valuable part of the healthcare industry for years to come. If your medical facility is interested in reaping the many benefits of outsourcing medical transcription services, contact Fast Chart today. Our knowledgeable medical transcriptionists have years of experience in the field and stay up-to-date on the latest advancements in the industry in order to provide your facility with accurate and dependable medical transcription services.